If you look at page 24 of our University’s Faculty Handbook, you will see the three criteria that are considered in granting tenure. These are the three criteria that define the quintessential professor. Teaching. Scholarly work. And service to the department, school, and University, and to your professional field and to the community. 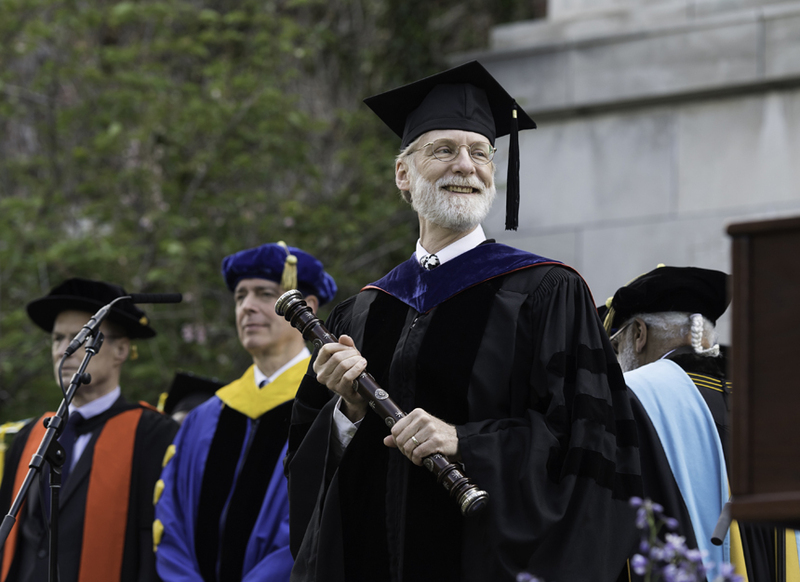 If you look at the 33-year career of our award recipient, at the University of Rochester, you will see a faculty member who has excelled in all of these areas. This year's winner of the Lifetime Achievement Award exemplifies the best traditions and highest achievements of academia, and that is why I am delighted to present this year’s Hajim School Lifetime Achievement Award to Michael Scott, the Arthur Gould Yates Professor of Engineering in the Department of Computer Science. Let’s take a closer look at what Michael has achieved in each of these three areas. Most recently, Michael created and has been teaching a course on the social implications of computing. This is very timely and puts us well ahead of the curve of what other computer science departments are doing; they are all just now starting to get into this subject area and realize its importance. Michael’s research has been widely cited and is well known around the world. It focuses primarily on systems software for parallel and distributed computing. He is best known as a co-creator of the MCS mutual exclusion lock and as the author of Programming Language Pragmatics, a popular textbook on programming language design and implementation now in its fourth edition. It is one of the definitive references in the field — and is one of two most widely used for the courses that teach this topic. Several algorithms from his group have been incorporated into the standard library of the Java programming language that we use every day. Michael is a fellow of the Association for Computing Machinery and the Institute of Electrical and Electronics Engineers (IEEE) and a recipient of the 2006 Edsger W. Dijkstra Prize in Distributed Computing. And I have to add that Michael's vision about research and the University, and the benefit of collaborative research, and the types of research that go on here, is also what brought me to Rochester. That could be considered a form of service, an often underappreciated part of what an outstanding faculty member does. And it is but one example of the service Michael has contributed over the years. He chaired the Department of Computer Science from 1996 to 1999, and was interim chair for six months in 2007, and again in 2017. He has played an active role in the University’s senate executive committee, as well as serving on the search committee for the dean of arts, sciences, and engineering. He is tireless in each of the service roles he takes on, making sure to contribute well above and beyond what is required of the role. It therefore comes as no surprise that he was the nominee of choice to co-chair the University’ Advisory Committee for the current presidential search. “Be a generalist! Take advantage of the interdisciplinary opportunities that Rochester has to offer. Never again in your life will you have a chance to learn so much about so many different things. If you are tempted to ‘get your clusters out of the way’ so you can focus on your major, think again. Life after college has a way of forcing you to narrow your horizons; don’t be in a hurry to do it any sooner. And if you are tempted to plan your courses around preparing for a job, think again. Job skills are great, but wisdom is greater. Now if that doesn't say it all, I don't know what does. It is my absolute pleasure to present Michael with the 2018 Hajim School Lifetime Achievement Award.